Built with the highest of expectations and based on the belief that every child can and will meet them, our college-preparatory, tuition-free schools are places of rigor and joy. We are determined to close the achievement gap and provide scholars with the quality schools they need and deserve. Achievement Prep currently operates three campuses –AppleTree@Achievement Prep, Wahler Place Elementary, and Wahler Place Middle – serving 1,000 scholars across all campuses. Achievement Prep has expansion plans to continue increasing its impact by opening additional campuses east of the Anacostia River. 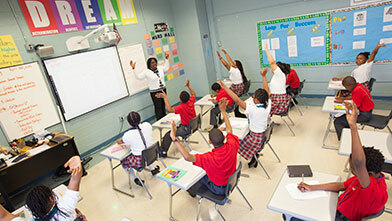 Going Above and Beyond: We believe that more time on task helps our scholars and teachers achieve great results. Our school day is 1.5 hours longer than the traditional public school, while our school year is 10–15 days longer. This extended instructional time provides an opportunity for intensive focus around literacy and mathematics and additional opportunities to provide students with academic support. Exemplary Teaching Matters to Us: Teachers are the greatest levers of change. 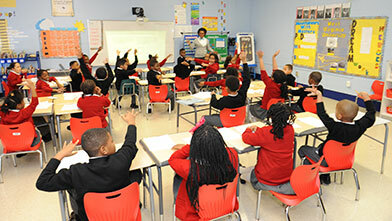 We commit to having a high-quality teacher in front of our scholars at all times. Our teachers are a determined team of educators who push one another to create and to sustain an outstanding environment for teaching and learning. We are driven by a belief that the quality of our instruction has the most immediate impact on our ability to achieve our mission. Laser Focus on Language Arts: Achievement Prep scholars have three times the amount of ELA instruction in comparison to their peers. Scholars receive 3 hours of literacy instruction each day. At our elementary schools, scholars receive literacy instruction in small groups, whole class, and via independent technology learning. By middle school, scholars are reading and analyzing complex literary text and novels, writing multi-page papers, and providing written analysis of complex topics. Making College a Reality: The primary goal of Achievement Prep is to provide a rigorous academic environment in which all students can achieve excellence. Our program puts all students on a college preparatory track. Beginning in kindergarten, Achievement Prep scholars are exposed to the idea of college and the fact that all they do each day is preparing them to go to college. All of our scholar advisories are named after a Platinum Teacher’s college/university alma mater. We refer to each grade of scholars by the year they will graduate from college. Our goal is 100% college acceptance and graduation. Character Is Key: In addition to creating high-achieving scholars, our job is to also develop and foster a strong character in our scholars. Each day, scholars focus on the development and explicit practice of Achievement Prep’s DREAM values (Determination, Respect, Enthusiasm, Accountability, and Mastery). We are committed to ensuring that Achievement Prep scholars will not just develop as intellectuals, but also as responsible citizens and leaders who have strong character and give back to their families and communities. J-Factor: Joy (J-Factor) is a cornerstone of each of our schools. Achievement Prep scholars love learning and knowing that each day they are “getting their brains stronger.” We infuse joy and excitement into our learning via chants, songs, and advisory calls. We also know that it is important to recognize scholars for their hard work, so we celebrate scholars with weekly recognitions and awards.